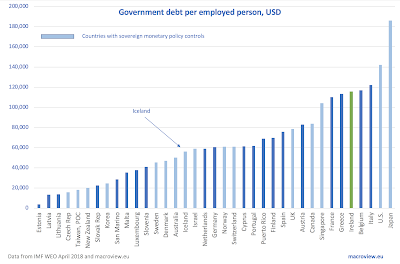 Ireland, as a younger, higher employment economy ranks fifth in the world in terms of Government debt per person employed (USD 115,765 in debt per employed). In terms of debt per capita, it is ranked in the fourth place at USD 54,126. Plucky Iceland, the country hit as hard by the Global Financial Crisis as Ireland and often compared to the latter by a range of analysts and policymakers, ranks 22nd in terms of Government debt burden per employed person (USD 56,185) although it ranks 13th in per capita terms (USD 32,502). In simple terms, Iceland has higher employment rate than Ireland, resulting in lower burden per employed person. 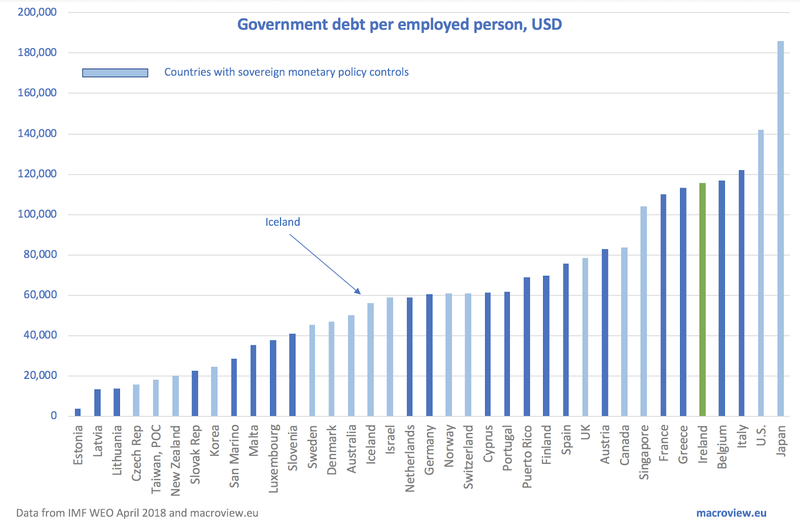 When one considers the fact that non-Euro area countries have more sovereign control over their monetary policies, allowing them to carry higher levels of debt than common currency area members, Irish debt per employed person is the third highest in the world after Italy and Belgium, and higher than that of Greece. Out of top ten debtors (in terms of Government debt per employed person), six are euro area member states (10 out top 15). Looking solely at the euro area countries, Ireland’s position in terms of debt per capita is woeful: the country has the highest debt per capita of all euro area states at EUR43,659 per person, with Belgium coming in second place with EUR40,139. In per-employee terms, Ireland takes the third highest place in the euro area with EUR93,378 in Government debt, after Italy (EUR98,314) and Belgium (EUR94,340). Labels: Advanced economies, debt, debt per capita, Euro, Government debt, Ireland, Ireland v Iceland, Japan, U.S.